and turned red, but I ignored it because I thought it was part of the normal healing process. The doctor today: "Why didn't come as soon as you knew it was red and tender?" So as it is, I have an infected wound abscess compounded on my facial nerve problem. I think I was so focused on the facial nerve problem (I can't close my right eye or smile on my right side and I have to sleep with an eye pad on), wondering when it would get better the way everyone said it would (Dr said 2 weeks, most patients say 3 - 6 months) that I forgot everything I knew about wound healing. So, I'm thinking of making this experience the first chapter of a new book (already commissioned after I finish a couple of projects) called "So, you want to be a doctor." This one is targeted at everyone who's curious to know what's it like to go through medical school (in this country) and to work as a doctor in a government hospital. Yes, it's a humorous collection of hospital anecdotes. I even know how to end this first chapter. "I only wish I had gone through all this before I became a doctor because it would have made me a better and more compassionate one." Then again, I'm getting an itch to write about strange beings that come out of suppurating abscesses to invade the world. Xeus, now didn't I hear someone say that doctors make the worst patients :) Seriously though I hope you'll recover quickly. No wonder it's so quiet around here. Write a story about it for DC 2. Take care. Thanks Lydia. When is your next press appearance? You're gonna get really famous soon. BTW MPH 1 Utama ordered 60 copies of your book, 10 more than they did mine at first order :) But it still wasn't there last time I checked. Can still walk, Lydia. Now's the time to capitalise on the most sales, while the book's still hot. Don't forget to ask for good space with all the bookstores, yes? 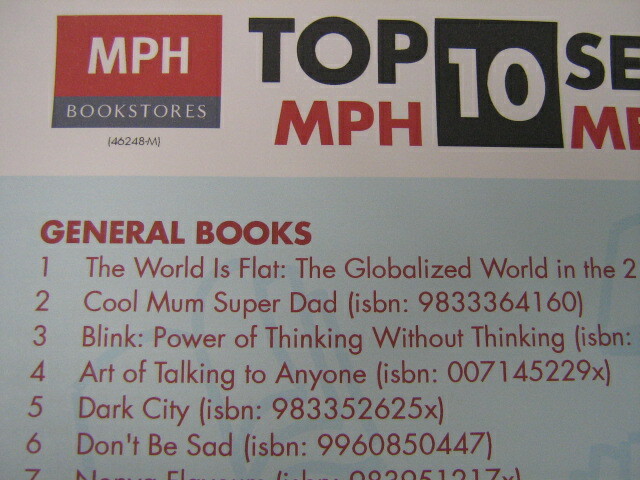 But being a MPH book, I'm sure they will give it good frontage. How mature do you have to be before you write?